Back when I was a professional cosmetologist it was nothing for me to purchase a new hair dryer every year. And sometimes, depending on the quality of the dryer, every 6-8 months. I remember purchasing my first Solano hair dryer and thinking that I spent WAY too much money for it. At the time, I probably paid about $60.00. Well...that dryer ended up lasting me four years. And I'm someone who had a tendency to drop my dryer on the hard cement salon floor several times a week, and even that didn't destroy it. So not only was it reliable, but also durable. Solano also provides diffusers, individual blow dry nozzles, and flat irons. 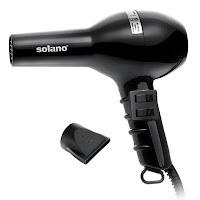 So if you're looking for a dependable, durable, and an overall outstanding hair dryer, I highly recommend Solano. You can purchase them through either Folica or Beauty Sak.